Along with being a nuisance due to scratching, biting and chewing, fleas can also present some serious health risks to you and your pets. Flea allergies can occur in both pets and people. While most victims of flea bites itch for just a minute or two, people and pets with allergies may itch for a day or more from just a single bite. Treatment may require steroids, medicated shampoos and ointments to help soothe the allergic reaction. Rodent fleas that take up housing on your dog or cat in the Southwest and southern Rocky Mountain areas of the U.S. may even carry the bubonic plague. 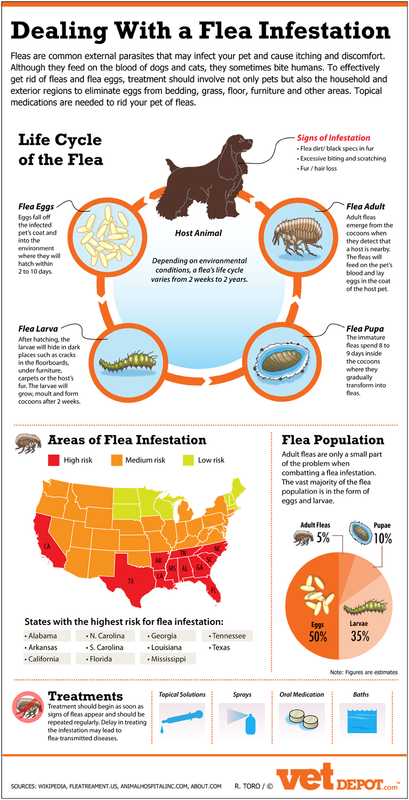 With one bite, infected fleas can spread this disease to your pets and your family. Tapeworms can also be spread from pets to people, primarily children, who accidentally ingest an infected flea. Two types of the bacteria Rickettsia that can cause typhus can be spread from infected cats to people by the bite of a disease carrying flea or contact with disease infected flea droppings. Cat scratch fever is a serious bacterial infection caused by Bartonella. Most human cases can be directly related to a scratch or bite from a cat carrying the infection. Fleas can spread the disease from cat to cat through bites and may also occasionally spread the infection directly to people via a flea bite. With the risk of all of these potentially serious health problems relating to flea infestations, a year-round flea preventative like K9 Advantix is a wise choice. Consult with your veterinarian about flea treatment options and recommendations should a flea infestation occur.